There is nothing better than seeing a toddlers eyes light up on a tractor ride, or getting involved with feeding the chickens, bottle feeding the lambs and other farm animals. A farm-stay is possibly one of the best toddler friendly holidays you can choose! Many of the farm stays on Holiday Tots not only offer hands-on animal experiences but some even offer special toddler-friendly breaks out of season. Animals have to be looked after throughout the year so take advantage of the cheaper prices outside the school holidays and after a fun day helping the farmer look after the animals, settle down in front of a lovely log fire with a hot chocolate. Spring time on the farm is fun too where all the orphaned lambs need a special hand, summer time speaks for itself, long evenings exploring and sizzling BBQs. Whatever time of year you are looking at, if your toddlers like animals they will love staying on a farm-stay. This luxury cottage has a traditional stone porch and is one of nine child-friendly holiday cottages in this family run farm. For families looking to reduce their carbon footprint on their next holiday head over to this loely farm-stay in the Stour Valley, Suffolk. The owners continued efford to reduce their impact on the environment pays off. They have installed a bio mass wood chip boiler to heat all the cottages and indoor pool and over 200 solar panels! The tots will love the animals too. A lovely cottage with baby room, wooden cot, heated indoor swimming pool, indoor barn with ball pool, babysitting, blackout blinds and amazing valley location near Combe Martin in Devon. Set in 7 acres of rolling Breton countryside, this gite has a fully enclosed swimming pool (shared with 3 gites) and loads of play equipment. 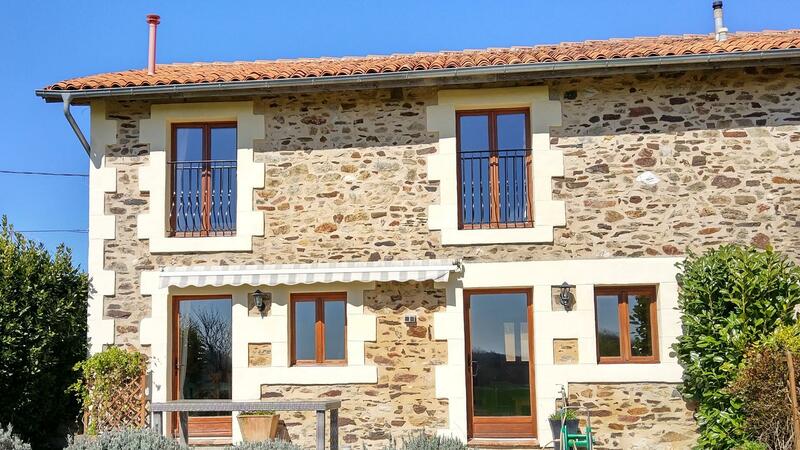 1 of 7 gites located in the Brittany countryside, 10 minutes from the sea. Enclosed private garden and castle and playground for the kids. This lovely four star cottage is one of six child-friendly holiday homes: it has its own private garden and shares the beautiful valley with five other holiday homes. Children will love to meet the farmyard friends and help Farmer John collect eggs and feed the lambs on this converted farmhouse property. This pretty holiday cottage with traditional stable door is one of eight holiday homes and is situated all on one level. A cosy two bedroom cottage located in South West Cornwall, ideal for exploring Cornwall's beaches and vast attractions. A secluded cottage loacted in the corner of this lovely chateau's courtyard. 14 acres of grounds with play areas, a swimming pool and lots of space to roam free. With plenty of livestock to meet and a plethora of child friendly activitiesthere is enough to keep the most energetic little ones happy on this delightful farm on the Isle of Wight. Voted as one of the best family-friendly farm stays by the Guardian and Telegraph. Located within walking distance to the local village this lovely chateau offers the whole family a wonderful holiday base for exploring the Charente in South West France. There are six child-friendly holiday cottages within the chateau's 14 acres with this one being the largest. It is ideal for grandparents as there is a ground floor bedroom with ensuite and. Stunning views from the private terrace, swimming pools, gardens, games barn, home cooked meals, animals to feed, the list is endless. The lovely Chateau de Gurat is located on the edge of a little village in the Charente, owners David and Nicki live here with their family and specialise in offering baby-friendly holidays. They offer a personal service with an abundance of equipment to make your stay that extra bit special. Home cooked meals are on offer as well as baby sitting, the choice is endless! One of eight lovely holiday cottages, converted from an old 18th century farm, approached by a long private drive two miles from the hamlet of Cardinham in North Cornwall. This lovely baby-friendly cottage in Suffolk offers a kingsize gallery bedroom with room for cot, private patio with its own hot tub in a beautiful family-friendly farm setting. There is a small farm shop onsite too with COOK meals and Hadleys ice cream and a huge collection of DVDs for a night in. A spacious and modern detached single story barn conversion, with open plan living, ideal for those wanting plenty of space. Located in a secluded location surrounded by countryside just 15 minutes walk from a beautiful sandy beach of Mawgan Porth. A charming cottage 10 minutes from Brittany's Southern coast line and sandy beaches. Private enclosed garden with views over the fields. Luxury eco cottage within walking distance to a sandy beach. A long list of baby items to hand plus a meal delivery service, or why not make use of the babysitting service and dine out for a change? This converted blacksmiths forge has been beautifully restored keeping its original features and is located amongst a working farm and its three lakes. Converted farmhouse property, boasting stunning views of the lakes and countryside, where children will love the working farm, collecting eggs and feeding the lambs.Voted as one of the best family-friendly farm stays by the Guardian and Telegraph. This luxury child-friendly holiday cottage is located near the ancient town of Lostwithiel, Cornwall and has wonderful views and lots of sunshine on its private deck. This cottage, restored to a very high standard, is light and spacious and located within a cluster of lovely child-friendly holiday cottages perfect for families with young children. This luxury cottage, ideal for babies toddlers and older children, is one of mine traditional Isle of Wight farm buildings converted to a high standard, nestled amongst a working farm. This cottage is set in a converted, medieval Tudor barn with wooden beams and original architecture. A two storey cottage in a secluded and peaceful farm setting that has been specificallyequipped for families with babies and pre-school children and offers a relaxing break in a stunning rural setting near the Cornish Coast. A compact cottage in a barn conversion situated on a farm with plenty of child and adult-friendly facilities. 1 of 6 cottages located in the grounds of a stunning chateau with its own private terrace. Lots of facilities on offer for families and plenty to help the adults to relax too. A two bedroom cottage located on the Lizard Peninsular in Southern Cornwall offering a lovely base to explore this beautiful area. An abundance of equipment is on offer here including steriliser, bouncy chair, bottle warmer, baby monitors, babysitting and more. 1 of 6 luxury cottages in this stunning chateau on the edge of a tranquil village, ideal for exploring rural france. With its own private terrace and 14 acres to enjoy. One of eight luxury holiday properties set in 13 acres of tranquil countryside in the heart of Cornwall. This converted farmhouse property is all on one level with outside courtyard overlooking the beautiful valley. It is the perfect base for exploring the farm and all that the Isle of Wight has to offer. This lovely converted farm has a total of nine family-friendly holiday cottages and offers the prefect location to explore Cornwall's South West beaches and attractions. This lovely farm dates back to the early 18th century. There are a total of eight child-friendly holiday cottages situated within 13 acres of tranquil countryside in the heart of Cornwall. This family-friendly character barn conversion in the countryside offers a perfect and luxurious base to explore Cornwall and within the grounds young children will love the experiences of donkey grooming, feeding the chickens and petting the guinea pigs. Owners, farmer Tim and family, have been running this child-friendly holiday farm in Cornwall for over twenty years. This lovely toddler friendly cottage has a Cornish stone fire place with wood burning stove. A luxury cottage with private patio and graden within the grounds of this picturesque chateau. 1 of 6 properties sharing a swimming pool, play barn and toys/games. A sunny cottage that's been comprehensively updated quite recently set in a family-friendly farm located in South West Cornwall near the ancient town of Lostwithiel. This former granary barn is now one of nine luxury cottages situated on this very beautiful child-friendly holiday farm on the Isle of Wight. From lodges through to luxury eco-cottages with indoor and outdoor swimming pools, soft play and lots of children's activities to keep the little ones very well entertained. The farm-stays listed on Holiday Tots are in some fabulous locations across France and also in the UK currently in Suffolk, Devon, Cornwall, the Isle of Wight and Wales so ideal for a toddler friendly holiday for a few days or a few weeks any time of year.